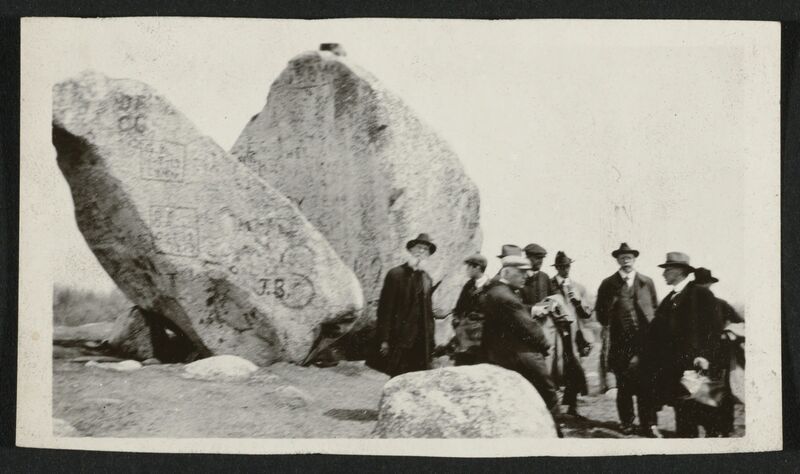 I have no idea who these men are, but given that the photograph comes from the collection of the Harvard University geology department, and is grouped with other photos of Cape Ann geology, I assume these men were visiting Whale’s Jaw in Dogtown to study it, not to picnic there. The photograph is dated “190?” Given the attire of the men and the dates of other similar photographs, I believe this is from just after the turn of the century. Click on the photo for a larger view. For another view of Whale’s Jaw, see this post. This entry was posted in Uncategorized and tagged Dogtown, Whale's Jaw. Bookmark the permalink.